Coral Reef Villa is sure to impress. It’s perfect for your next family vacation, with sleeping for 26 and a game room that has something for everyone. It’s like its own mini-resort with a covered pool and quiet, white-sand beach. The first floor could hold one family, and the upper floor could hold another, or all the adults can have the bedrooms and the kids can bond sleeping in the game room and loft. Beachfront villa on Seven Mile Beach! 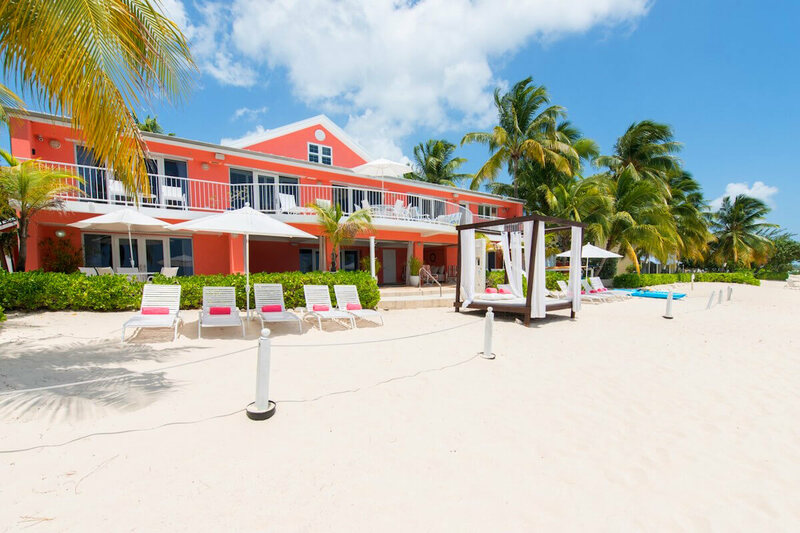 Coral Reef is a spacious beachfront villa situated on a quiet stretch of Seven Mile Beach. The villa is only a short drive or walk to George Town’s shopping, water sports, golf, restaurants and gyms. Daybeds and loungers dot the beach, which is steps from the back door. There’s a private pool under the covered terrace, with a hot tub. The wet bar is a few steps from the pool, with a dining counter, blender, and wine fridge. A winding staircase next to the bar leads up to the study, which has a library, desk, pinter, and telephone for work tasks or studying. This level also holds the game room, where guests can watch a movie on the flat-sized TV, throw darts, play a board game, or sink into a beanbag with a book. There’s also a billiards table that converts into a ping-pong table. The fully equipped kitchen, dining room for 10, and utility room are on the upper level as well. The living area has plush seating and opens to the balcony, where guests will find lounge chairs and a grill. There’s a full size bathroom that services the game room and living areas. The villa sleeps up to 18 people in seven bedrooms, with additional bedding for kids in the game room. There are four bedrooms on the main floor, each with an ensuite bathroom and TV. Two of the bedrooms have private terraces and the other two have no exterior access. There are king-sized beds and twin beds on this level, perfect for a family. The upper level has two more king suites, plus a bunk room with two twin bunks and two daybeds. Additional bedding consists of two twin Murphy beds, a daybed trundle, and an airy loft space with two queen beds and one twin. Guests can expect daily maid service, except on Sundays and public holidays. Rates do not include: tax of 13%, island charges of 5%. pool size 12 ft.x 24 ft. Non motorized water equipment and baby equipment such as playpen, 2 strollers, 2 car seat boosters, and stair gates are included.